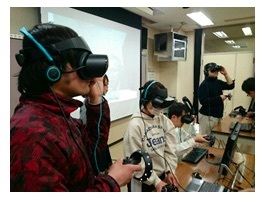 TOKYO, Nov, 19 2018 - (JCN Newswire) - Fujitsu Limited and Kagawa University today announced that they have launched a trial study using technologies such as virtual reality (VR)(1) and telepresence(2) to promote understanding of disabilities and improve expertise in special needs education. With the cooperation of the Kagawa Prefectural Board of Education, the Shodoshima Town Board of Education, and the Tonosho Town Board of Education, Fujitsu and Kagawa University have embarked on a study with the goal of delivering inclusive education where everyone can learn together, regardless of whether or not they have a disability. 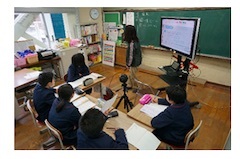 The study will be conducted from November 20, 2018 through March 31, 2019, involving about 50 teachers and support staff at a total of five schools, including Shodoshima region elementary and middle schools involved in educating children with disabilities, as well as a high school where the special class instruction system was implemented beginning in the 2018 school year. The study will also include the teachers and staff at an education center in Kagawa Prefecture that conducts research on education as well as training for those working in educational fields. The special class instruction system is regulated by the School Education Law. Under this law, children and students with disabilities receive the majority of their lessons with the rest of their grade level, but also receive special instruction between one and eight times a week in a separate classroom in order to improve or overcome difficulties due to their disability. For the 2018 school year, this system was extended from elementary and middle schools to include high schools. In this study, three trials will be conducted, consisting of a disability VR experience, which uses VR to simulate the difficulties experienced by children with disabilities, training through remote observation of lessons, using a fully spherical camera capable of capturing 360 degrees video, and remote education consulting, which connects experts providing training with teachers on isolated islands through video conferencing. Ultimately, the trials aim to offer support for instructors that handle special classes by raising their expertise and deepening teachers' understanding of disabilities. In addition to evaluating the effectiveness of these three methods, the study will also consider an effective ICT utilization model for inclusive education. In order to deliver inclusive education, the Ministry of Education, Culture, Sports, Science and Technology (MEXT) began the special class instruction system in elementary and middle schools in 1993, providing opportunities for special instruction for students with disabilities to help them overcome difficulties they might encounter in learning or in their daily lives. This system was expanded in April 2018 to encompass high schools as well. Educational authorities have recommended that all teachers engaged in classroom instruction have a certain level of expertise in special needs education, but this effort has faced a number of issues. These challenges include a lack of experts to train teachers, insufficient understanding of disabilities on the part of schools and teachers, and geographic difficulties in providing teachers at schools on isolated islands or remote areas with training from experts in special needs education. In order to resolve these issues, Kagawa University and Fujitsu will conduct a trial study using ICT to promote the understanding of disabilities by teachers and support staff, and on providing remote training and support from experts. The study aims to deepen the understanding of disabilities on the part of teachers and support staff at elementary, middle, and high schools on remote islands, as well as improve expertise in special needs education through training, in order to deliver inclusive education. About 50 people at the following five elementary, middle, and high schools in the Shodoshima region and elsewhere, as well as at the Kagawa Prefectural Education Center. Professors Satoshi Sakai and Eiichi Miyazaki of the Kagawa University Faculty of Education and their teams will work with Fujitsu to build a VR environment to teach people the difficulties experienced by children with disabilities through a VR simulation. The organizations will use a VR head-mounted display to provide teachers and support staff with a simulated experience of the hypersensitivity of those with autism, via a spherical video created by the UK's National Autistic Society, and then evaluate the effectiveness of this experience. Video of classes for students who need special support will be captured using fully spherical cameras set up in the classroom, and experts will watch the video using equipment such as a head mounted display that provides a sense of being there, providing appropriate advice to teachers and support staff on topics such as teaching methods and how they approach their students. Professors Satoshi Sakai and Eiichi Miyazaki of the Kagawa University Faculty of Education and their teams will work with Fujitsu to connect (Cisco TelePresence) video conference system by Cisco Systems and the (Cisco Webex Meetings) web meeting service by Cisco Systems through Fujitsu Managed Infrastructure Service FENICS II Universal Connect, Fujitsu's network service, building a remote support system so that teachers and support staff at schools on isolated islands and in remote areas can receive appropriate advice. The study will be able to confirm the effectiveness of face-to-face remote education consulting through screens using this system. Kagawa University and Fujitsu plan to widely publish the results of this trial study into remote teaching consultation and remote training to audiences such as educational institutions across Japan. In addition, Fujitsu will develop ICT services that reflect those results, contributing to the achievement of Goal 4 of the Sustainable Development Goals, "ensure inclusive and equitable quality education and promote lifelong learning opportunities for all," which aims to achieve targets such as promoting the flourishing of all types of people. (1) Virtual reality Technology for creating environments that feel like real experiences and that seem to exist despite not having an original object through displaying objects three-dimensionally using 3D data. (2) Telepresence Technology that provides a very real sense of being in one location from another location, utilizing technologies such as high quality sound and high resolution video.